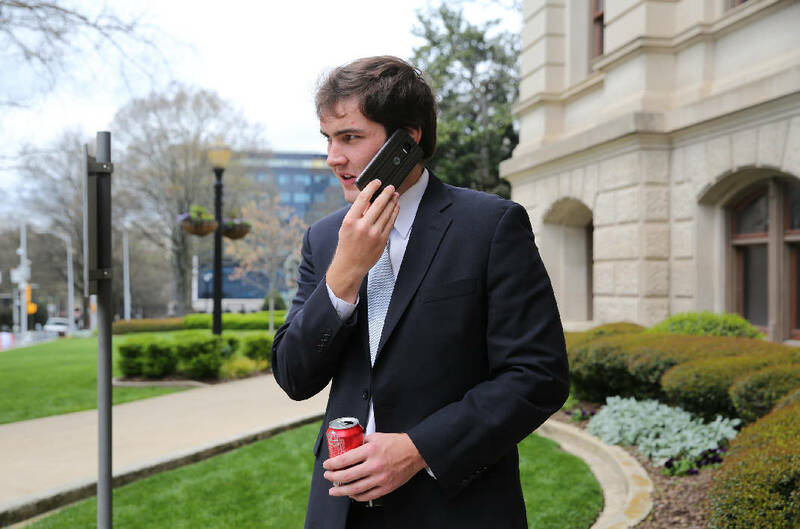 Staff photo by Erin O. Smith / Colton Moore, 24, makes a phone call before returning to the gallery of the House of Representatives at the Georgia State Capitol in Atlanta, Ga., Thursday, March 29, 2018. 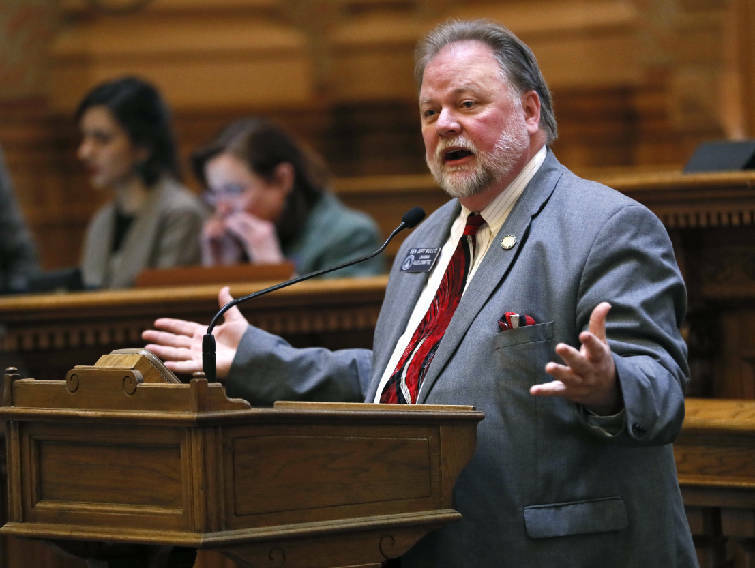 Moore spent Wednesday and Thursday shadowing his opponent in the upcoming election, State Rep. John Deffenbaugh, R-Lookout Mountain, and watching the final legislative session for the Georgia House of Representatives. State Rep. Colton Moore said his bill to change a school tax break for the elderly in Dade County is dead, and he believes one of the most powerful members of the Legislature helped spike it. Moore, R-Trenton, said he met with legislative counsel four times over the last three weeks to explain how he wanted his bill to look. Each time, the draft came back differently than he requested. After the most recent drafts came back Wednesday and Thursday, he said he was giving up. But Moore, a freshman who has not been afraid to criticize his party's leadership, has a theory on why he's had so much trouble. He believes state Sen. Jeff Mullis, R-Chickamauga, has orchestrated confusion to hold him back. "Legislative counsel has been used to obstruct the process," Moore said. "That's Mullis' influence." Moore does not have any evidence of this. Mullis denies Moore's claim. "I'm proud he thinks that I have that much [influence]," Mullis said. "But legislative counsel is separate. I am not involved. His problem is his inexperience and his lack of listening to people." During his campaign last year, Moore promised to amend the Dade County Board of Education's "65 and 5" exemption. Since 2005, residents 65 and older have paid no school property taxes on their homes and up to 5 acres of property. Moore argued that the exemption was too big, allowing rich "carpetbagging Yankees" to retire in Dade County and pay no taxes, while working-class families handled more than their fair share. After some members met with Moore, the school board voted Feb. 4 to pass a resolution, asking him to create a local act. If passed through the legislature, the act would put a referendum on the November 2020 ballot, asking voters if they wanted to amend the "65 and 5" exemption. The board's amendment had two parts. First, residents 65 and older would no longer receive a complete exemption. They would instead get $150,000 reduced from the assessed value of their properties. If a home was worth $200,000, for example, it would be assessed as if it were worth $50,000. Second, the amendment would create a "waiting period." Property owners would not receive the exemption until they lived in the county for at least five years — a potential solution to those "carpetbagging Yankees." When news of the proposal hit, some residents complained. They called Moore, and Moore announced a Feb. 24 town hall to discuss the legislation. At the end of the meeting, after hearing from several angry residents, Moore decided to modify the legislation. He would keep the five-year "waiting period." But he said he would cut out the requested $150,000 tax benefit. Instead, all residents 65 and older would continue to receive a 100 percent property tax exemption. This is where the problems began. Most of them were esoteric, the types people with law degrees worry about. First, the bill was considered a local act because it will only affect a specific community. As a rule, the local act has to be advertised in the county organ — in this case, the Dade Sentinel, which publishes every Wednesday. In the first edition after Moore's town hall meeting, an ad appeared. Contrary to what Moore wanted, the ad still contained the $150,000 tax benefit. Moore did not publish the ad. Superintendent Jan Harris did. She received the language from Mullis. Mullis said he was trying to help Moore, believing that he may not go through the proper steps in time to get the bill filed and passed by the end of the 40-day session. "I knew that we were coming down to the wire," Mullis said. But Moore said Mullis should have known the ad was incorrect. In addition to the public statement at his town hall, Moore said he also told Mullis he wanted to eliminate the $150,000 cap. As a matter of policy, the representative passes the local act first, then Mullis pushes it through the Senate. "Mullis had no right, in my opinion, to run that legal notice," Moore said. "Not until my meeting occurred." The confusion about the ad only delayed the bill a week. Still plenty of time to fix the problem and push the bill through. Moore submitted his own ad, which ran March 6. This meant the bill could have dropped for the first time last Monday. But the bill still hasn't dropped. Moore said the drafts from legislative counsel keep coming back wrong. On March 4 — a week after he said he first told the lawyer he wanted to do away with the $150,000 cap — Moore said he still received a draft of the bill with the cap in it. On Wednesday and Thursday, Moore said he received two new bills that strike close to what he wants. The bills would put two referendums on the 2020 ballot. The first referendum would ask voters if they wanted to create the five-year "waiting period" for the tax exemption. The second referendum would then eliminate the current tax exemption rules. The lawyer explained to Moore that he needed both bills to create the solution he wants. But he is worried. If voters approve eliminating the current tax exemption but don't pass the new one, with the five-year "waiting period," what happens? Do the residents lose both exemptions? Will this cause an even bigger headache? As Moore recalled to the Times Free Press, the lawyer assured him this scenario won't play out. The elimination of the current exemption is contingent on the passage of the new exemption. In other words, if voters reject the proposal about the five-year "waiting period," they will still have the current exemption. Nothing would change. Nothing to fear there. But after this process, Moore explained he is weary. He doesn't trust the process right now, and he's not going to file the bill. Meanwhile, the Dade County Board of Education will vote Monday on whether to rescind their request to Moore from last month. Harris, the superintendent, said she expects the board members to take that action. Given that Moore isn't going forward with the bill anyway, the vote won't carry much weight. "The people who are most hurt by this are the citizens of Dade County," Moore said. "It's disappointing. I just want to express my apologies. I tried to be as open as possible. I tried to be fair." Mullis pointed out that this referendum can still happen. The election isn't until 2020. The lawmakers have another whole session to pass a local act to get any changes on the ballot.